وجه العملة شعار شركة جمهورية المعادن وعبارة "Republic 5 g Fine Gold 999.9 Refiners Assayers"
شعار شركة جمهورية المعادن وعبارة "Republic 5 g Fine Gold 999.9 Refiners Assayers"
5g Republic Metals Corporation Gold Bar Buy a 5 g Republic Metals Corporation gold bar at the lowest price through our online store. We ship worldwide, your order may qualify for free shipping. Republic Metals Corporation is based in Miami, has been in business since 1980. 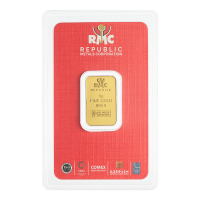 RMC gold bars are recognized as good delivery bars by the LBMA, COMEX, SGE and SBMA. Their green refining technologies make them one of the most environmentally friendly refiners of gold and silver. These fractional gold bars are a great way to diversify your gold holdings, order yours today.